Spriggan Sap is only available as already-harvested samples. 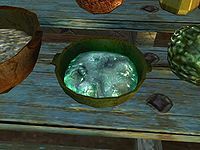 Contrary to what is stated by the official Game Guide, it is not dropped by spriggans—they drop taproots instead. Version 2.0.0 of the Unofficial Skyrim Patch allows spriggans to drop this ingredient or taproot upon death. This page was last modified on 3 June 2018, at 18:02.